Along with the stiffening of the immigration policies the unsavory illegal business of selling false papers and false promises of legalizing status become common. Two undocumented workers caught in the Ft. Madison raid, who were eligible to become permanent residents, paid rip-off artist $1,000 each to process their permanent visas. This guy operated out of Chicago so you can see the extent of this illegal activity. You can also see that strict immigration policies give rise to an increase in illegal activity and exploitation. 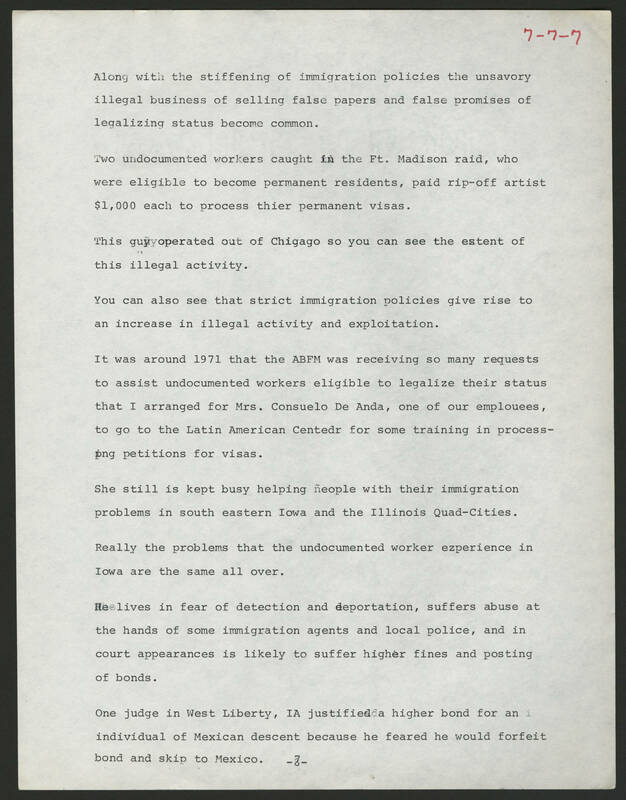 It was around 1971 that the ABFM was receiving so many requests to assist undocumented workers eligible to legalize their status that I arranged for Mrs. Consuelo De Anda, one of our employees, to go to the Latin American Center for some training in processing petitions for visas. She still is kept busy helping people with their immigration problems in south eastern Iowa and the Illinois quad-cities. Really the problems that the undocumented worker experience in Iowa are the same all over. He lives in fear of detection and deportation, suffers abuse at the hands of some immigration agents and local police, and in court appearances is likely to suffer higher fines and posting of bonds. One judge in West Liberty, IA, justified a higher bond for an individual of Mexican descent because he feared he would forfeit bond and skip to Mexico.